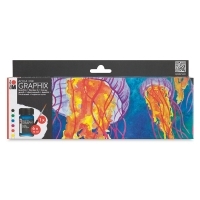 Marabu Aqua Ink Graphix is an ultra-brilliant, waterbased watercolor ink that is naturally transparent and highly lightfast. 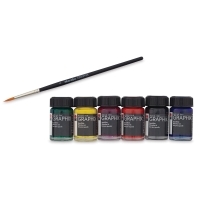 Use it with a brush or drawing pen for watercolor techniques. Combine it with other drawing materials such as Marabu Fineliners and Aqua Pens for designing expressive motifs and brilliant backgrounds. Even when dry, Aqua Ink Graphix can be dissolved completely with water. Shake vigorously before each use. The Marabu Aqua Ink Graphix McFloaty Set includes six 15 ml bottles of ink, one each of Black, Cyan, Lemon, Magenta, Mint, and Vermilion.